Backstage Spotlight is the Center’s technical arts training program for high school students interested in stage production. Taught by the Center’s professional production staff, students learn an array of technical skills, ranging from lighting and sound to rigging and scenic design. 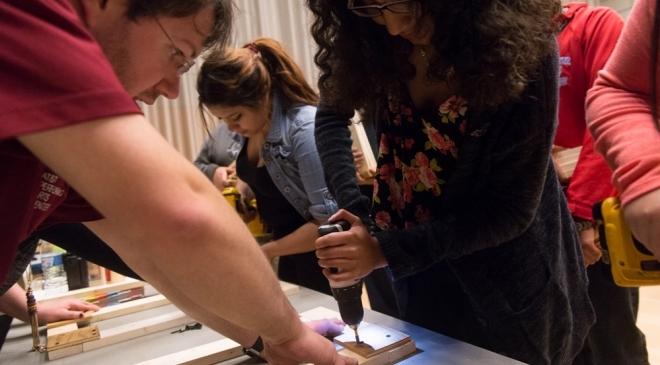 Furthermore, students develop a portfolio that highlights completed projects and demonstrates their abilities as promising stage technicians to colleges and future employers. This seven-class series spans the entirety of the school year, culminating in students attending a professional performance together as a group. At the completion of this course, students leave with a foundation of technical theatre knowledge and the confidence to pursue career opportunities in the field. Check out this Backstage Spotlight student’s experience! Backstage Spotlight is generously supported by the Neiman Marcus Performing Arts Education Endowment, Bank of America, The Craig and Kathryn Hall Foundation, Turning Point Foundation, Texas Commission on the Arts, W.P. & Bulah Luse Foundation, Fichtenbaum Charitable Trust, Sammons Enterprises, Inc. and individual contributions to the Center’s annual fund.